Have you seen these Lay's Stax chips? A rip-off of Pringles, I would say. They come in 11 flavors (in my vast research) in the US. From sour cream and onion to dill pickle. But, you've got to travel a bit to find this variety. Click on the smaller pic to enlarge if necessary. Thai Curry Crab. What a way to ruin good potato chips! And Thai. And Curry. And Crab! Yikes! 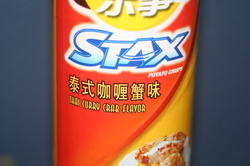 Stax aren't bad, but I'd still get Pringles. Even in the test Wal-Mart back in Bentonville, we didn't have Thai Curry Crab Flavor. For me, fancy chip flavors are good for about the first two or three chips, and then it's just kind of nasty (but the Thai Curry Crab probably wouldn't even make it that far). wow..and we thought we were living dangerously with garlic onion.. we are such daredevils ya know..
Moo Goo Gai Pan flavor?